The go–to guide to acing the Series 65 Exam! Consisting of 130 multiple–choice questions in the areas of ethics and legal guidelines, investment strategies, investment vehicles, and economics and analysis, the Uniform Investment Adviser Law Examination (Series 65) is designed to qualify candidates as investment adviser representatives. An indispensable resource for anyone preparing to take this tough three–hour exam, Wiley Series 65 Exam Review 2016 was created by the experts at The Securities Institute of America, Inc. It arms you with what you need to score high and pass the Series 65 Exam on your first try. 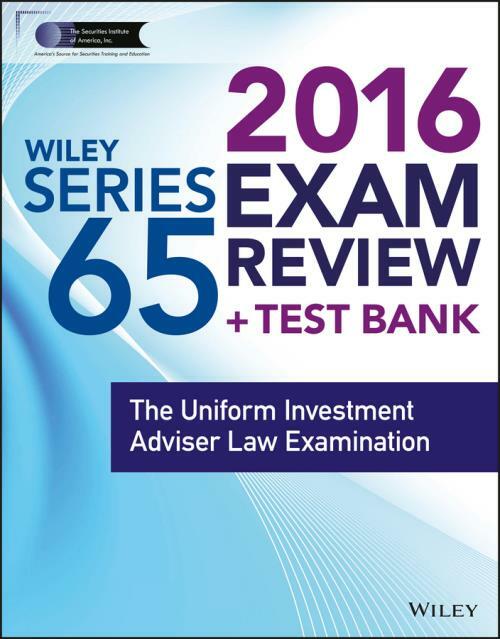 Wiley Series 65 Exam Review 2016 is your ticket to passing the Uniform Investment Adviser Law Examination with flying colors! Visit [external URL] for more information. As a result, you can choose a securities training solution that matches your skill level, learning style, and schedule. Regardless of the format you choose, you can be sure that our securities training courses are relevant, tested, and designed to help you succeed. It is the experience of our instructors and the quality of our materials that make our courses requested by name at some of the largest financial services firms in the world. To contact The Securities Institute of America, visit us on the web at [external URL] or call 877–218–1776.